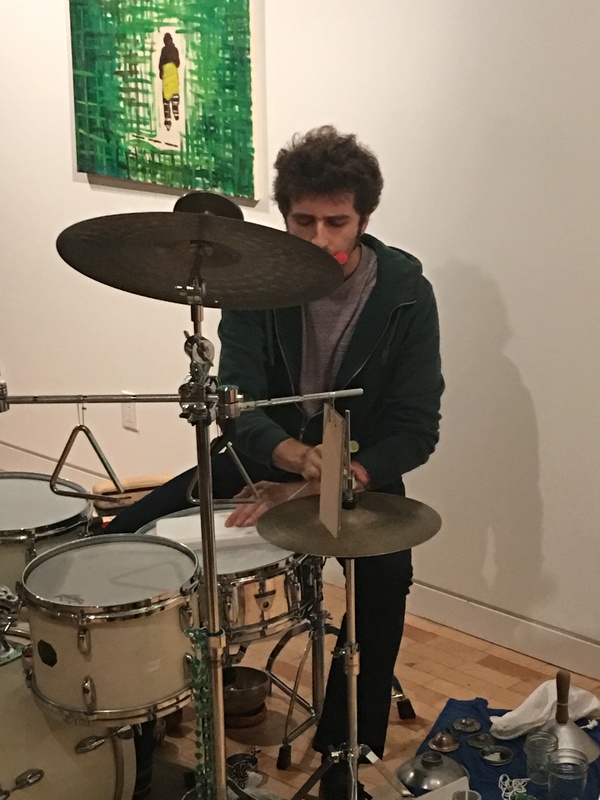 Earth Tongues, a trio consisting of Joe Moffett (trumpet, other objects), Dan Peck (tuba, bells, tape), and Carlo Costa (percussion, other objects) released their second record, the double-disc Ohio, at the art gallery Happy Lucky no. 1, on Thursday night. All three members of the band displayed their sensitivity as listeners, their imaginative abilities as improvisers, and a collective sense of consciousness that moved, evolved, grew, and faded together in a striking symbiosis. 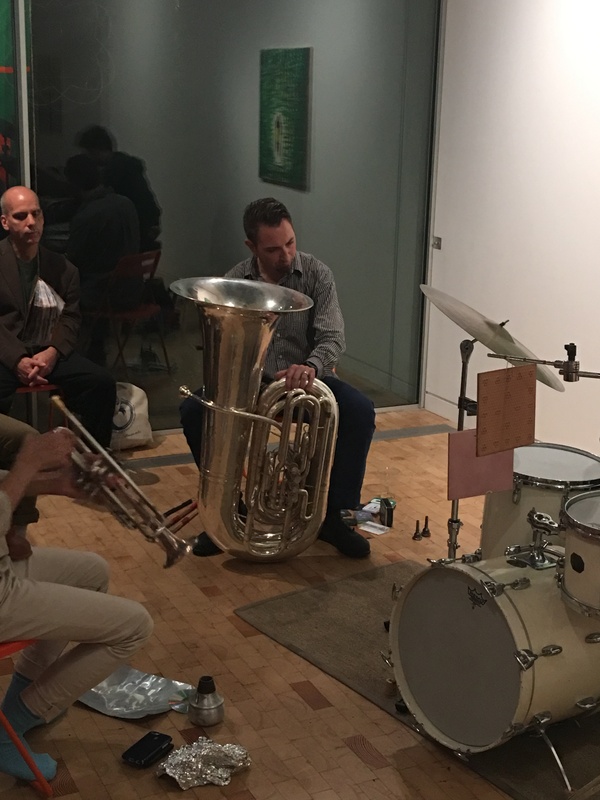 The band played one long immersive piece that featured many sustained sounds, based on shifting communications between players all of which was entirely improvised. Then, at times, they would suddenly diminish down to just one player, giving space for one of the members of the trio to either work through quiet sounds or to advance an idea alone to move in a new direction, before being rejoined by the others. Many of the sounds were not quickly absorbed and processed. Rather, the music is meant to be digested gradually. Though the band’s set clocked in well under an hour, they exhibited a tremendous patience that they have developed from longer performances–the band having previously performed three-hour sets in other environments. Though Moffett often seemed to be driving the action–pushing his sounds to advance the group down a particular path–all three took turns leading the way. 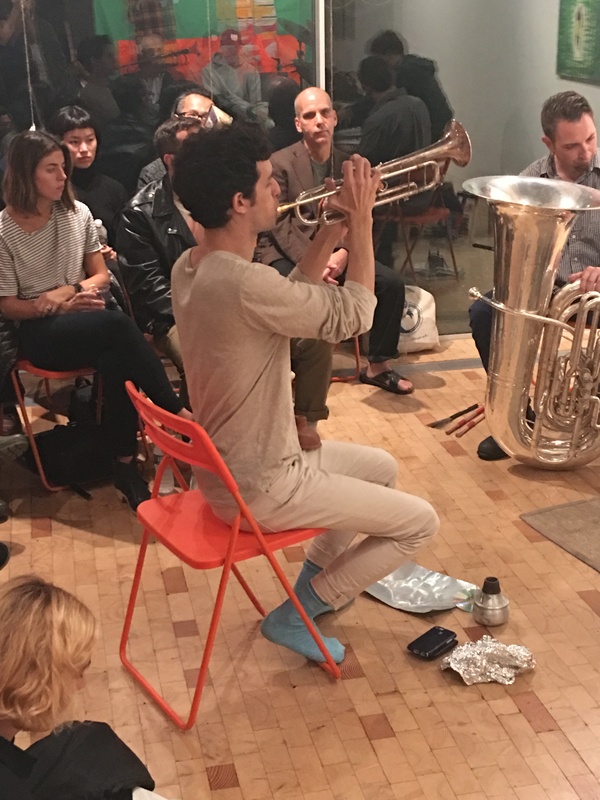 Often one would lay down a carpet of baseline sound, noise, or even rhythm, while the others played over the top either with additional layers of sound or by accenting with sharper, shorter sounds of breath, small bells, tapped instruments, bowed bowls, triangles, woodblocks, and the like. Eventually a more steady rhythm emerged from the organic early explorations that felt very honest after all that had led up to it. The music then surged gradually like a collective organism expanding with one massive breath before diminishing down to silence. The event was well-attended and the audience was attentive throughout, many people lying on the floor, eyes closed, completely absorbed by the experience. Moffett is a trumpet player who deserves more attention. 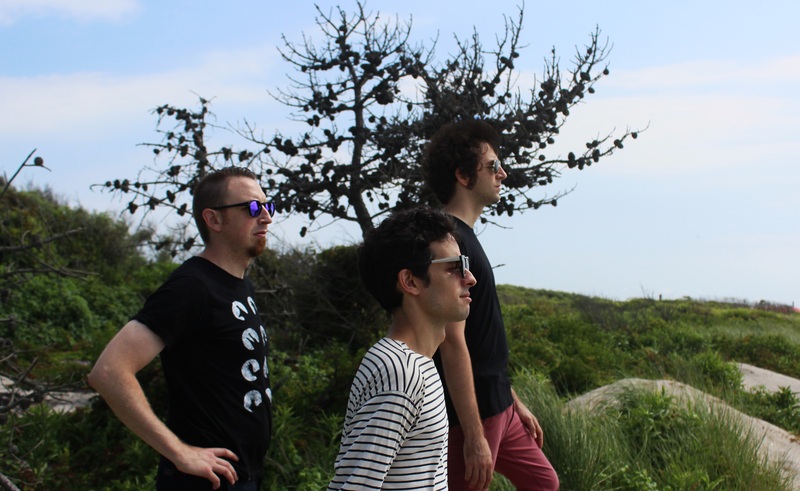 Peck has garnered some recognition, mainly for his sideman work, but who also leads a number of cutting edge improvised music ensembles, including The Gate. Costa is something of a percussion visionary with an incredibly melodic ear, who is always is exploring new rhythms, small sounds, and who has as much of a facility for using space as any percussionist in recent memory. The Earth Tongues set followed a solo performance by Aki Onda, who used multiple radios and light in an eclectic, daring experimental performance. Come out and support the regular music series at Happy Lucky no. 1, happening on most Thursday nights.